*We currently have no available openings. Thank you for stopping by! who, at their FIRST audition, all earned a rating of SUPERIOR! Welcome to Katherine's School of Music online! Located at Gotta Dance in Albion, NY, we offer a comprehensive music education through our piano, flute and low brass lessons. For all of our students, ranging from age 5 to retirement, weekly lessons consist of 1) solid technical training, 2) a high quality listening curriculum, 3) practical theory training, and 4) the study of high quality music drawn from a variety of excellent sources. Performance opportunities are offered through monthly master classes and studio recitals; adjudication opportunities are offered through the International Guild of Piano Teachers and the Royal Conservatory Development Program. Additionally, because music appreciation is an important part of becoming a life-long participant in music, each monthly master class will focus on various aspects of music history, performance and theory in the form of activities, games and discussions. Each topic is geared toward connecting students to the wide world and history of music and musicians while showing how to apply that connection to their playing today. Please, stay and look around our site. Be sure to check out partner lessons and brass teacher David Hollenbeck. Additionally, I've provided lesson rates and my open slots. look inside Helen Marlais' Real Music for Kids (Solo Piano Music). By Helen Marlais. By Helen Marlais. For piano. CD. Classical Piano Music. Classical Period, Romantic Period and Baroque. Listening CD. Published by The FJH Music Company Inc (FJ.SRCD1002). Starting this year I have another option for pianists looking to get more out of their piano study: Adjudications through the National Guild of Piano Teachers! It's been my goal for several years to become an active member and the time was finally right. Ask me about them!! Click on the link above to visit the site and learn more about this excellent national program for music students. Katherine's School is on Facebook! 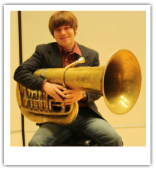 Katherine's School accepts low brass students! Katherine's School is located at Gotta Dance! 28 West Bank Street in Albion! "Your child was born musical, and should be given every opportunity to explore and develop his or her musical skills. Music helps mental development, promotes high-level coordination skills, engenders many social skills, enables creativity, and boosts confidence and it can also be beneficial for your health! Music is the perfect vehicle for learning and every child should experience the sheer joy that music can bring."